Olentangy senior Lauren Tarpey looks to pass during a practice last week. 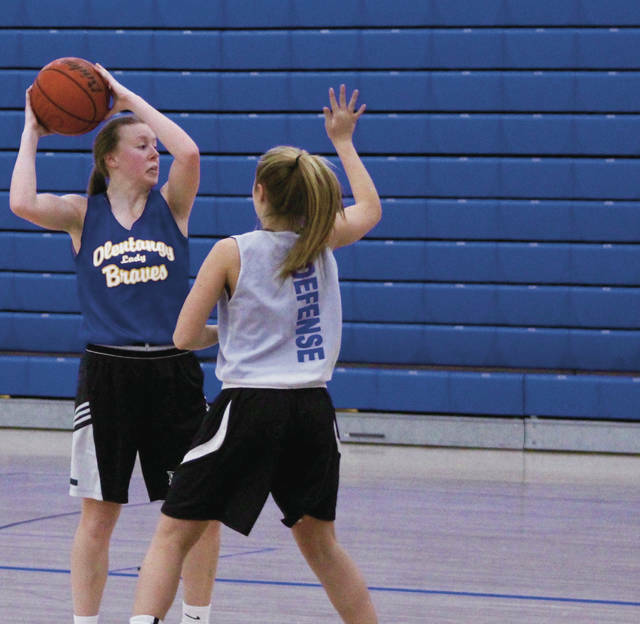 It doesn’t take much effort to find a priority for the Olentangy girls basketball team. It’s written on the back of their practice uniforms. So, why is defense so important to new coach Kate Cummings? Cummings comes to Olentangy with an impressive resume with stints at the college level at Ohio Dominican and Findlay where she amassed a 311-231 record over 18 seasons before stepping away in 2013. She went from one extreme to the other after leaving the college ranks. She’s coached fourth-, fifth- and sixth-grade girls basketball in the Olentangy Youth Athletic Association before coaching seventh-grade ball at Shanahan Middle School last season. “It’s been a lot of fun and a great learning experience for me coaching different levels,” Cummings said. “To me – it felt like a natural fit because I already had a relationship with the kids and the community. Cummings takes over for Mike Daniels, who went 22-25 in two seasons. Tarpey was a role player in 21 games last season, but should see an increase in responsibility this year. Cummings has the unique opportunity to coach her daughter Bailey, who is entering her junior season. Bailey is one of four players who saw action at the varsity level last season, playing in 22 games. Sophomore Meg Spohn, who highlighted the season with a half-court buzzer beating three-pointer to beat Teays Valley in the first round of the district tournament, returns at guard. Sophomore Dani Beidelman made the jump to varsity at the end of last season. Her sisters Megan and Rachel also went through the program. Megan is the first head coach at Berlin. Olivia Margolies is a familiar name that makes her return to basketball one last time for her senior season. She, along with sister Emily, are signed to play volleyball at Ohio University next fall. Margolies averaged 11.8 points, 5.0 rebounds and 1.9 blocked shots in 19 games as a sophomore. Senior Olivia Corley, sophomores Kennedie Doup and Helena Ronnebaum and freshman Bridget Stafford are newcomers to the varsity level. Olentangy opens against Miami East in the opening round of the Skeeter Classic Friday at 5 p.m. and hosts either Urbana or Mechanicsburg the following day.